I think almost everyone who has ever tried to cook anything vegan has hear of Isa Moskowitz. I’m not going to introduce her here again because I’ve already reviewed tonnes of her books (you can find the posts in the Cookbook Sunday Archive), but she is pretty much the uncontested queen upon the throne of the vegan cookbook realm. Her newest book, Isa Does It, focusses on every-day, easy to make, easy to eat dishes. We’ve been using this for dinners a lot, and I love that it’s very produce-oriented, with well-balanced meals and easily available ingredients. There are lots of types of recipes to choose from, from soup over burgers and salads to dessert, and almost all of them are completely feasible for a weekday meal. If I have any complaints at all about Isa’s previous book of the same type, Veganomicon, it’s that many of the recipes took too long to make. Not so with this book. An added bonus is the fact that Isa Does It has full-colour photos for nearly every recipe, taken by the almost painfully talented Vanessa Rees. The days of picture less vegan cookbooks are well and truly over, but Vanessa’s images really take things to the next level. Overall, I would definitely recommend this book to anyone looking to freshen up their recipe arsenal. I’ve used this quite a bit since buying in June and so far, everything has worked out really well! The soup chapter alone is worth it! 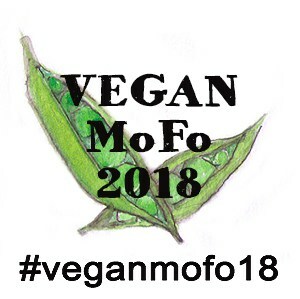 Vegan MoFo 2017 | Let’s Go!